Our bestselling corkscrew is now available with a solid black granite handle. Enhancements to our regal replica of an antique corkscrew promise years of effort-free openings. A smooth-gliding, Non Stick coated worm removes corks (natural and synthetic) with a simple pull of the handle. Inner workings and grapevine-relief casing made of lasting zinc alloy. Pewter finish. Can also mount to your bar or tabletop. Do these corkscrew stands pull plastic corks? I am so frustrated that even quality wines are now using them. I cannot use my ah-so anymore and even twist screws chew up the cork. Help! BEST ANSWER: We bought this for our good friends. We have had one for years and love it. It opens plastic corks as well. Never fails us! Well worth the money. 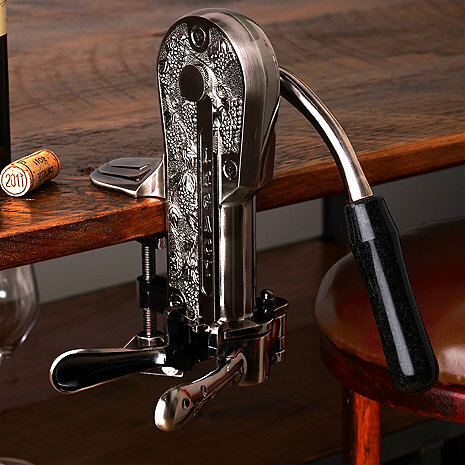 The Legacy Corkscrew with Black Marble Handle (Pewter) removes both natural and synthetic corks. After 10 years of use the old one developed an unfixable problem. After 10 years of use I was spoiled by my Legacy corkscrew - so easy to use. Happily bought a new one!! Didn't know what to get our friends for 50 years married. We decided on the beautiful corkscrew because we love ours and we've had it for 20 years. We incorporated it into a basket of local wines and chocolate. Shhh.....it's a surprise. I love it. It is attached to my counter and is a conversation piece. I would definitely recommend it. Love it. Really simple way to aeriate wine. Rinse and repeat. Works as great as the first one I purchased a few year back,this one will be used as part of my deck accessories. Works great, easy to use. Love this opener. Looks nice sitting on the wine bar in our kitchen.